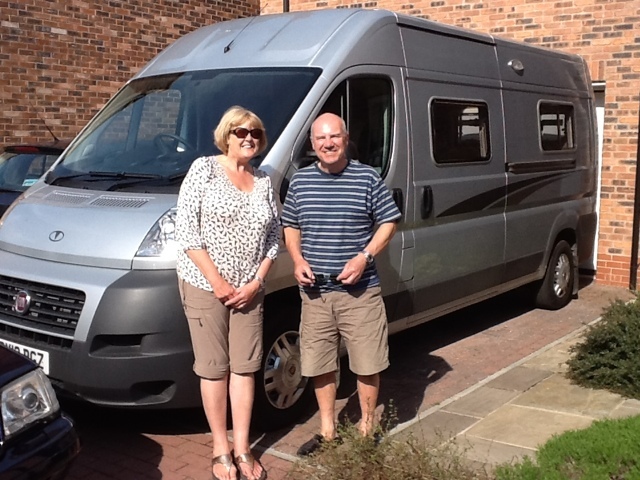 The Trees Campervan Trips: Introduction to "Rex"
Carol and Graham proud owners of our new motorhome. A Vantage Sol 6 metre panel van conversion from Vantage Motorhomes in Leeds. Preparations are now well under way with the date set 15th May to embark on our first adventure. Rex has proven to have caused a few teething problems! The fitting where the table leg fit in the lounge area became loose and very wobbly just a week after delivery -this was fixed by Graham repositioning it,rescrewing and glueing it in place. After talking to Vantage, this is what they would have done. An overnight trial with gas power only - demonstrated a lack of hot water caused by a fuse problem-remedied by a return to the Vantage factory in Leeds. The side door mechanism appears to be faulty- ? Something to do with the roller device - booked in with Fiat dealer this week. Graham suspects that Rex was an ex demonstrator having been hawked round all the motorhome shows. Well I suppose we did get the equivalent demonstrator discount - it just wasn't revealed to us. Let's hope that is our 3 problems out of the way! The next week will be spent stocking up supplies,working out what to take with us etc. We will then hopefully have a couple of nights stay on a campsite for further testing prior to setting off on weds 15th May. Carol will attempt to post a map of our proposed route soon ......or may be a list if unable to overcome techy stuff! Week 2. Orkney and back.